Don't settle for second best--cruise first class. The distinction becomes apparent upon boarding our luxurious 60' cruiser, The Nighthawk II. Custom built in the late 90's, our vessel is the largest charter boat in operation on Lake Nipigon. Whether you choose a fishing, hunting or kayaking excursion, picturesque Lake Nipigon provides the perfect backdrop for your charter vacation. Our sterling reputation for being the "best on Lake Nipigon" is based on 25 years of experience and good service, with your comfort and safety being our priority. Vacation packages include home style meals and roomy, on-board accommodations. We cater to groups of six to ten and welcome corporate and business trips. Charter length is flexible, varying from five to seven days. Typically, we travel a few hours each day and harbour overnight in protected anchorages. 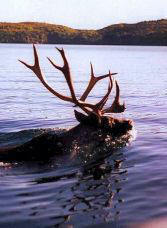 The shores of Lake Nipigon provide habitat for moose, black bear, otter, beaver, and the woodland caribou, which is considered to be a "threatened" species. Bald eagles, pelicans, cormorants and great blue herons also nest on the shores and islands of the Lake. The plaintive call of the loon in the wild, pristine setting of this large lake completes a wilderness experience long remembered.